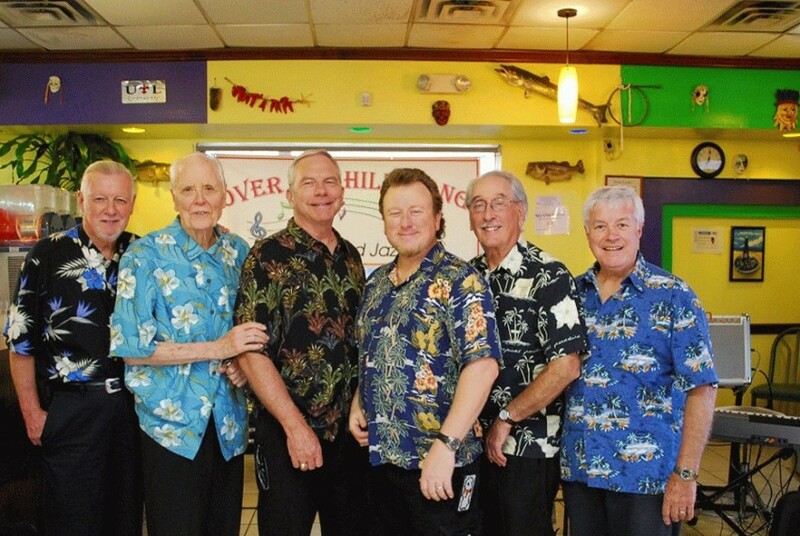 This band has been going since 1975 and has played all around the Houston Texas area. Primarily plays Dixieland Jazz but includes classical Jazz styles such as Big Band, Old Standards etc. Primarily a 6-piece group but has extra players when available. All music is improvisational (no music sheets or arrangements) and features individual breaks by the players as decided Ad Hoc. Fun performances and jazz history education. Since band does not use music sheets or "charts" it is all freestyle and subject to the deviations from the music expected in improvisational jazz. Frequently the band all play the same song but don't expect that to be guaranteed! General History of the “Over-The-Hill-Gang” band. 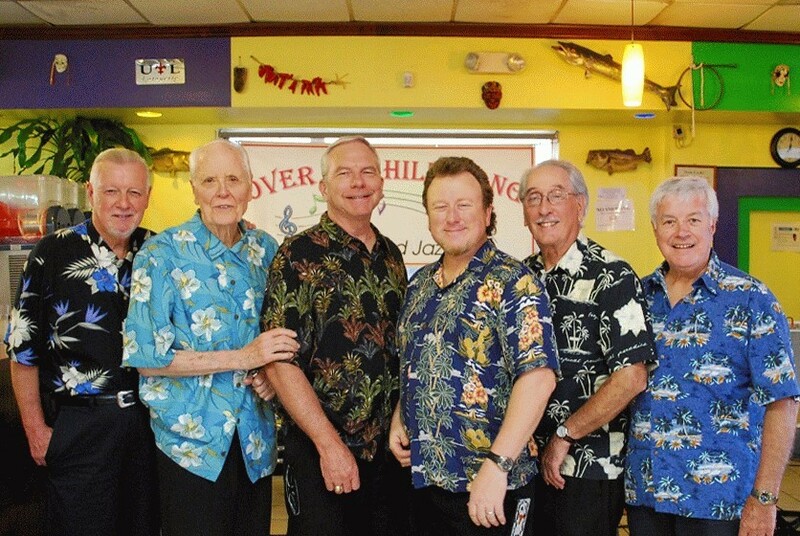 The ‘Over-The-Hill-Gang’, (hereafter referred to as the ‘OTHG’, the ‘gang’, the ‘group’, the ‘band’, or the ‘boys’) was founded in 1973 by Gilley Stoltman (Concertina & Banjo) who gained permission from his boss at PANJO’S PIZZA PARLOR (located in Town & Country Mall), to play for his Wednesday night customers. Gilley was like a magnet and drew musicians to him. Al Steudebaker was one of them. He played trumpet and a talented female employee named Phyllis was asked to accompany Gilley on the piano. The ‘group’ was an immediate hit at PANJO’S and literally packed the place week after week. Not long after the ‘band’ was up and running, Will Connolly came onboard as it’s Irish tenor vocalist and Gene Noser added another banjo to the sound. After performing with great success at PANJO’S for over a year, the owner talked Gilley into becoming his partner at the VILLAGE INN PIZZA PARLOR on Fondren near Bissonnet. It was at this location in 1974 that the ‘gangs’ current leader, Mike Evans, came onboard when the piano position opened up. Then, owing to the ‘OTHG’s infectious style of play and popularity, and it’s ever willingness to accommodate anyone with a desire to pick, pound, push, prod, much less blow an instrument, the flood gates opened and the band developed one of its early signature characteristics. That is a band with a set of core members who were joined every week by as many as five to ten players (including a bagpiper), with some of these becoming regulars themselves. This resulted in from 15 to 18 showing up on a weekly basis for the regular Wednesday night sessions. Business problems between Gilley and his partner caused the closing of the VILLAGE INN PIZZA PARLOR after less than a year, temporarily leaving the ‘gang’ without a “Gig”. Will Connolly found the ‘boys’ their next Wednesday night ‘spot’ and thereafter became the band relocation director for the next 27 years. It was in 1975 at a downtown seafood eatery named HUBER‘S, owned and operated by Joe Huber, who was an avid music buff. The ‘Over-The-Hill-Gang’ joined a list of very talented groups holding court at HUBER‘S, each on their own night of the week. These bands included a New Orleans styled aggregation called ‘The Market Squares’ who for most of the next twenty-five years would play on Thursday night at the same spot as the ‘OTHG’ would be playing on Wednesday nights. Not long after the ‘group’ began its tenure at HUBER‘S, it played it’s single most inspirational and prideful jobs. It was July 4th, 1976, at Allen’s Landing for the Nations Bicentennial Celebration. Here the ‘gang’ and 20,000 fellow Americans exchanged goose bumps with the playing of God Bless America and countless other memorable songs which recalled the spirit and fiber of this great country. Thus began a long stay at HUBER’S that lasted until late in 1984 when Joe sold it to Bruce Barton, who changed the name to BARTON‘S LANDING. The ‘boys’ stayed on into early 1985 when, due to the unfortunate demographic changes in the downtown area, they were again looking to Will Connolly to find a better venue. Will was resourceful as usual and the ‘band’ moved to the BAVARIAN GARDEN‘S on Feagan Street, a lively spot near downtown and undisputed No. 1 Oktoberfest site in Texas. This job lasted through most of 1987 until the lease on the business expired. Over the next couple of years, Will was instrumental in locating engagements at MR. A’S UPTOWN (summer of 1988) and then a sleek dining and dancing establishment called BEVERLY‘S, which lasted for nearly a year. Both of these businesses were located on Richmond, and they provided a good outlet for the ‘groups’ ability to showcase its versatility in playing for listeners, diners and dancers. On May 23, 1990, the ‘gang’ began an engagement at the SHAMROCK INN on South Gessner that lasted until March 1, 1995. This long run was interrupted for three weeks in September 1990, for a quick stop at the EMPIRE ROOM on 1960 West. The stay at the SHAMROCK INN was highlighted several times on a special television feature with Alvin Van Black as host. This lengthy run (almost five years) was mostly enjoyable and filled with good times, but underlying problems with management caused the ‘band’ to end this stay even though they did not have another place lined up. Consequently, a six-month hiatus followed until the ‘groups’ drummer, Bob Geier, helped line up the PINE FOREST COUNTRY CLUB. This rather upscale job lasted for approximately one year, until the middle of November 1996. During a portion of this period (summer of 1996), the ‘boys’ were recruited to play for eight special dances at the prestigious PETROLEUM CLUB in the downtown Exxon Building. Then, between November 1996 and November 2000, other than two months between September and November 1998 when the ‘gang’ had a short stay at RICK’S LOFT on 1960 West, the ‘band’ had it’s longest period without a permanent ‘home’. Since the end of that drought, the ‘OTHG’ has had many different Wednesday night ‘spots‘, beginning on November 7, 2000 with a return to the SHAMROCK INN that lasted for nearly a year, until October 24, 2001. Two short stops followed, the first being for one week at MISSION BURRITO on Memorial, and the second for three weeks at EL TIEMPO, a nice Mexican Restaurant on I-10, immediately west of downtown. After a four-month hiatus, the ‘band’ landed at LANDRY’S on Westheimer. This was a four-month gig ending May 29, 2002, and was followed unbroken by a two-month stay at BRIAN O’NEIL’S in Rice Village, ending on August 8, 2002. 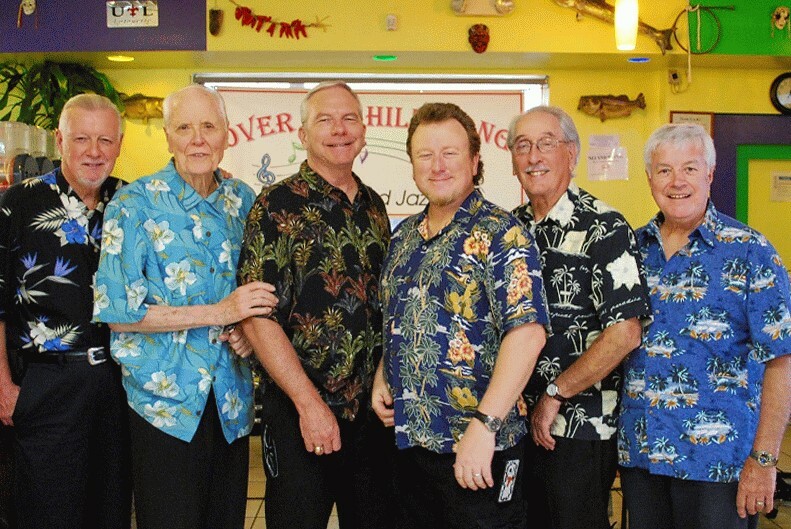 Between November 6, 2002 and March 12, 2003, the ‘gang’ played at a great restaurant with a western flavor called the PECOS GRILL, located on East T.C. Jester, located just south of the North Loop. Beginning March 19, 2003, the ‘boys’ opened an engagement at a supper club style cabaret named the 1415 GRILL. Owing to the fact that this eatery has a wonderful menu of gourmet seafood and steak dishes, and a large spot-lighted dance floor, the ‘gang’ has seen an increasing number of dancers, both new and past fans who have rediscovered the ’band’. Following 1415's re-classification of its entertainment business, the band took a brief sojourn at the Forum, an exclusive retirement community on Post Oak. A chance encounter by the drummer, Curly Lewis, enabled the band to move to it's next location for about 3 years, The Golden Hunan Restaurant on Memorial Dr., which, unfortunately, was relocating to a smaller venue in late 2007. The band then started performing Wednesdays at Cosmos Cafe at 69 Heights Blvd and Washington, 7:00 to 9:30pm. Cosmos was sold and closed in December 2007 so then the band went back at the Golden Hunan! After the Golden Hunan finally relocated, the band found a new venue at the famous beauty spot “VARGO’S”. Unfortunately our drummer Curly passed on soon after and the band continued with our current drummer, Lou, who had been sitting in for Curley frequently. After playing at Vargo’s for a while, the band found a more compatible location at the “Lafayette Cajun Seafood Restaurant” on West Belfort at Wilcrest, and are there now, still playing Wednesdays. Whenever a smaller group of players are required for other performances, other band names are used to easily differentiate the styles. One of these is the “Pryme Tyme Jazz Band” playing jazz classics and standards and another is the “Bayou City Buskers” who perform standards and old favorites with a few snippets of education about music. This is only the latest chapter in the odyssey of the ‘Over-The-Hill-Gang’, because the ‘group’ expects to be around a spell longer. Surprises could also be in store, as well it should be for the band that’s “OLDER THAN AMERICA” (collectively that is), and aging very well. We carry our own instruments and sound equipment. As long as the lighting provided is not too bright, we can perform reasonably well (remember, we are not pretty close up!). Most ragtime/dixieland and some big-band music. Most influenced by age! We are all old enough to remember the music we play because we were brought up listening to it. Not requiring music sheets or charts shows that we play by ear adding whatever nuances we want. This is the fun of improvisational music. Early Jazz (jass) musicians left their mark on the musical community from the late 1800's till 1940's, and it is our intent to guide listeners toward remembering the growth of this style of music. Keep a reasonable distance between band and front row of audience unless they are hard of hearing. Need enough room to cater for up to 8 old codgers!